366 pages | 34 B/W Illus. As business becomes increasingly globalized and China establishes its growing role in the international business environment, developing an understanding of the complex culture is important to anyone acting in the global arena. 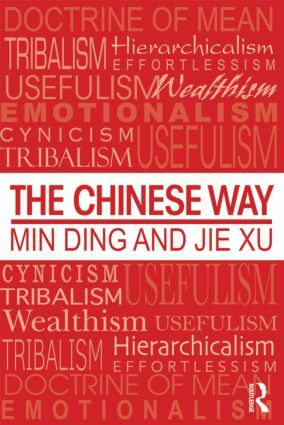 This book offers readers a thorough and nuanced resource to that end, describing the ever-evolving Chinese way of life circa 2014, based on extensive primary and secondary data. Taking an anthropological approach to achieve a well-rounded representation, the book covers 51 topics that would have been studied if China were a newly discovered civilization. It explores the culture through its examination of the nine core concepts that best represent the Chinese way of life. While the book is a rigorous treatment of the Chinese way of life, it is also filled with personal stories and perspectives from close to 1000 successful Chinese from academia, business, and government. The Chinese Way equips international business students, scholars, and practitioners with a deep understanding of a society that is a major player in global business today and offers a foundation for successful business interactions with Chinese companies, organizations, and people. Min Ding is the Smeal Professor of Marketing and Innovation at Pennsylvania State University, USA and Advisory Professor of Marketing and Director of Institute for Sustainable Innovation and Growth (iSIG) at Fudan University, China. Jie Xu is a Research Associate at Institute for Sustainable Innovation and Growth (iSIG), Fudan University, China.